When it comes to Italy, everyone knows about Rome, Venice, Naples, and even the region of Tuscany. During our month-long road trip through this beautiful country, we made it a point to get to know that other Italy – the real, less-talked-about Italy – and this is what led us to Le Marche. The Le Marche region is pretty much unknown and is often seen as an alternative to the popular Tuscany. Situated by the Adriatic Coast, this is the perfect place to completely avoid the hordes of tourists in high season. It is also very budget friendly, and boasts not only stunning coastal sights but also, in my opinion, the tastiest and purest Italian cuisine, expansive fields full of sunflowers and extremely friendly locals. You can take a direct flight from Brussels Charleroi, Berlin Tegel, London Stansted, Munich (or many other European cities) to Marche Airport, formerly known as Ancona Falconara Airport. If you only want to explore the coast, travelling by train is doable. However, if you want to discover more of the region, I recommend renting a car. We stayed at an unimaginably beautiful agriturismo called Vecchio Gelso. It was located on top of a mountain in Ortezzano, a region known for its fruit trees, vineyards and unspoilt nature. It was super cozy and quiet, and we received a very friendly welcome. You can take a dip in the pool if you want to unwind. Oh, I must mention the food! Everything on your plate is locally produced and pure. We ate incredibly delicious meals and ordered a bottle of local red wine for just EUR 6 (Tip: Be sure to try the artisanal green tomato jam). This is the largest cave system in Europe. I have been to several caves all over the world and these were the most impressive by far. Apparently, the first chamber of the Frasassi Caves is so large that even the Duomo di Milano (the Milan Cathedral) could easily fit inside. It is mandatory to visit the caves with a guide (which costs about EUR 18 per person) or you can do a speleo tour. When you’re driving towards the caves, you will first pass by a large parking lot full of tourist shops where you can leave your car and then take a tourist bus to the caves. You know me – I go ballistic when I see things like this. So, we drove to the caves, where there just a few parking places. Yay, lucky! This beautiful church in a cave was a definite highlight of our trip. If you keep driving a little further, say for five more minutes, from the Frasassi Caves, you will be able to spot the Temple of Valadier high up on the rocks if you look closely. Keep an eye on your Google Maps, otherwise you will definitely drive past it because there aren’t any indicators or signs. 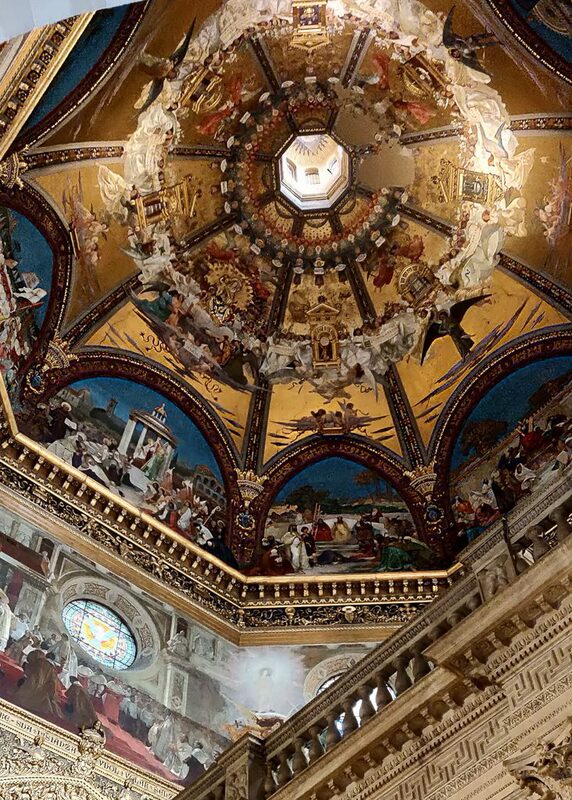 This dome-shaped temple was built in a hidden cave mouth as a refuge for sinners in search of absolution. The steep 700-meter climb is somewhat intense, but there’s a paved road and it’s really worth it. We only met a few people along the way, and once we arrived at the church, we found ourselves to be all alone. If you walk a bit into the cave, the pleasant temperature drop will cool you down and you’ll enjoy stunning views. This is truly one of my favorite lakes in Italy. It’s big, beautiful, quiet and you can swim everywhere. The beaches alongside are pebbly, so take water shoes with you. 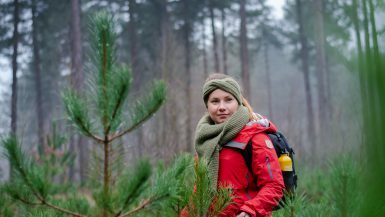 And it’s also the ideal camping place (yay, wild camping!) if you want absolute tranquility and love staying in the water. There are also kayaking and slacklining options, if you’re into that kind of thing. If you continue to drive to the tourist area (which, thankfully, isn’t too big), you’ll find some catering establishments, campsites and a sunbathing area. When I think of a city with feeling and atmosphere, Ascoli Piceno immediately fits the bill. While we were there, the local market occupied the most beautiful square, the majestic Piazza Arringo. This square is the place where the locals meet, both now and in the past, and the palpable buzz is pleasant. 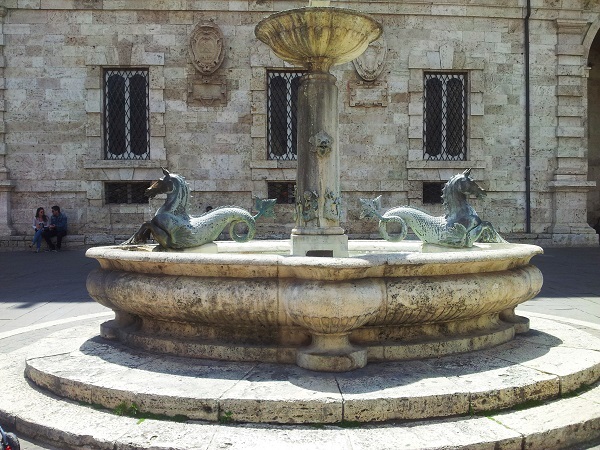 Here, there are two beautiful fountains that were built in 1882 (depicting bronze seahorses, a fish, angels and gargoyles) and the locals still drink from these. In this town, they are used to seeing tourists and travelers, which is certainly not the case in some places in Le Marche. Here’s a little geographical perspective for you: Ascoli Piceno is located in central Italy, in the south of the Le Marche region. It lies at the same height as Rome, but on the other side of the country, 25 kilometers from the sandy beaches and the Adriatic Sea, at the foot of the Apennines. A culinary stop at Migliori in Piazza Arringo is a must. Be sure to order a portion of olive ascolane, the city’s speciality. 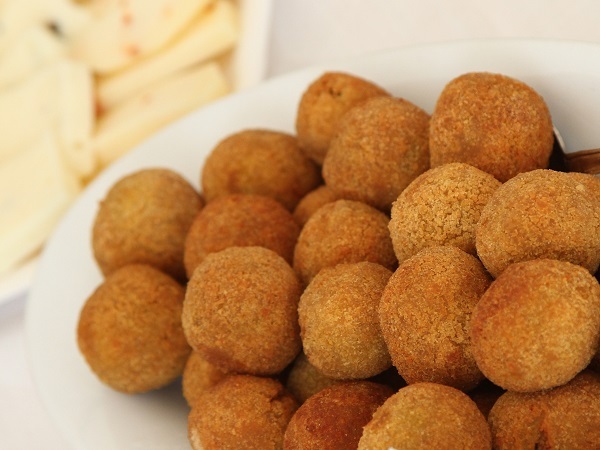 These are meat-filled olives that are breaded and deep fried. Near Piazza Arringo is the Palazzo dell’Arengo. Passing through, we saw some little girls enthusiastically rehearsing new songs they had learned in kindergarten. 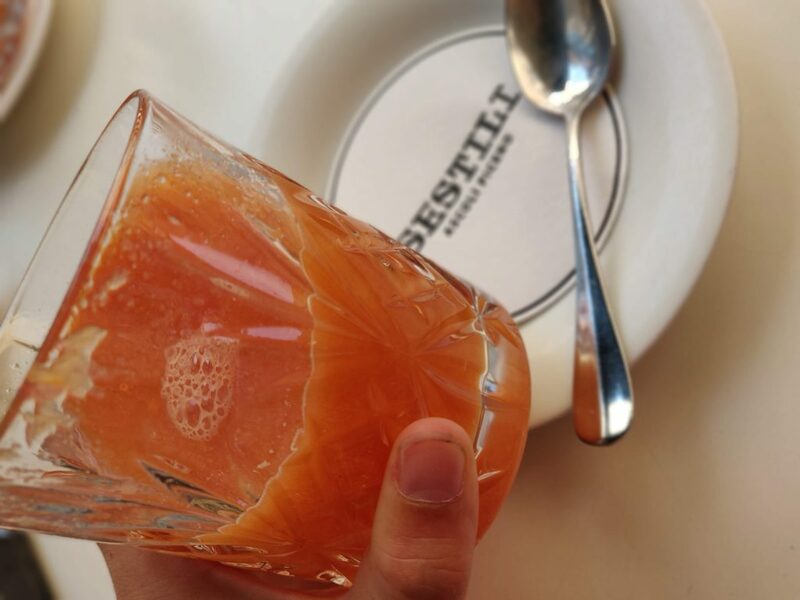 A nice stop for a drink is Sestili bar. Also, Caffé Meletti in Piazza del Popolo is perfect for a coffee break. This town is kind of like that little sister of Assisi. It boasts an impressive cathedral and is a one shop next to another with Holy Mary statues. And so, these were some of the highlights of my trip to Le Marche. Given the impressive sights and sounds, the charming people, the history, and the delicious cuisine, would I visit again? Absolutely! Have you been here? Let me know about your experience!